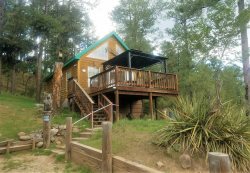 This adorable cabin has all the Ruidoso charm you are looking for all while located close to town, off the main road of Sudderth. The outdoor deck has a grill as well as great views. High Mountain Cabin is decorated with rustic charm, with all the modern amenities. You will not be disappointed in this Ruidoso charmer. *Winter Snow Conditions may require 4wd or Chains! Cozy Cabins Real Estate, LLC.